Ok, I’m behind on my word count, but it’s not like I’m so behind I’ll never catch up. I haven’t started writing yet today. My current word count is 12,235. Not bad for 9 days of writing. Which doesn’t make me a sucky NaNoWriMo’er (Yes, it’s a word — I just used it! ), it just means that, when I put my heart and mind into it, I can sit down and spew out a bunch of words that may or may not be the work of a literary genius form complete and/or coherent sentences. And, as you can see by the above handy dandy gadget up there, hitting 50K is still completely doable! 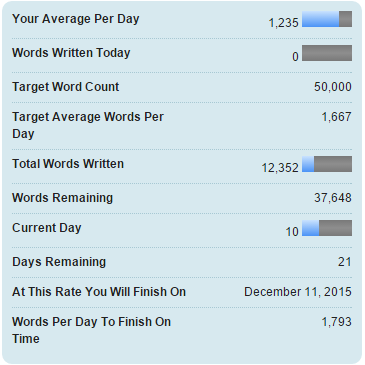 I just need to average 1,793 words/day instead of 1,667. Before NaNo started, I actually did an outline. I had my characters all figured out… I was a total Planner! Hey guys, I know I’ve been gone for a while. It definitely defeats the purpose of having a blog if I’m not going to post, but I just haven’t been able to lately.